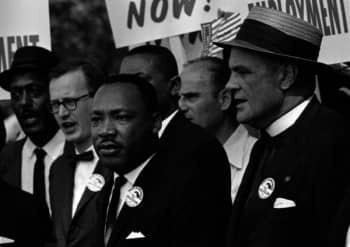 Dr. Martin Luther King Jr. at the march on Washington in 1963. WARWICK, RI — Today is Martin Luther King Jr. Day, celebrating the legacy of the renowned Civil Rights leader and advocate of non-violent protest in the struggle for equality for all races. The day is a federal holiday recognizing King and a day of service for millions of Americans. Non-essential Government departments are closed, as are many corporations. King’s efforts in the early days of the civil rights struggle are memorialized in Selma, which you can rent on Redbox or stream on Amazon. In Warwick, city hall and the school department are closed for the holiday. Trash and recycling are delayed one day. Public transit company RIPTA is following holiday routes on Thursday. Check the RIPTA website for schedules. TF Green State Airport is operating, with arrival and departure schedules online. Banks are also closed. The Ministers Alliance of Rhode Island will commemorate Dr. Martin Luther King, Jr. at their 35th Annual Martin Luther King, Jr. Scholarship Breakfast at Rhodes on The Pawtuxet, 60 Rhodes Place, Cranston. American Baptist pastor and civil rights leader Rev. Dr. Sammy Vaughn will serve as the featured speaker at the event. Each year at the breakfast, students are awarded scholarships to help continue their education and pursue their dreams. You may still buy tickets at the door, first come first served. Tickets are $35. Doors open at 7 a.m.
There’s a 50 percent chance of snow showers, mainly between 8 a.m. and 4 p.m., on Monday, according to The National Weather Service. Little or no snow accumulation is expected. The NWS predicts a chance of snow after 2 p.m. Tuesday, then snow after 11 p.m. Tuesday night. Total snow accumulation is expected to be between two and six inches.